Buddhist nun and chef Wookwan breaks the boundaries of spiritual exercise and culinary practice in this first-of-its-kind cookbook of Korean temple cuisine. Wookwan gives us a delicious introduction to preparing clean food with sincere practices; healthful for body, mind, and spirit. As the first volume of temple cuisine - Wookwan’s Korean Temple Food: The Road to the Taste of Enlightenment - published in English, Wookwan herself has written a meditative, elegant volume that introduces the reader to Korean temple food, including what it means to care for the ingredients at each step of preparation, following the three key principles of cooking temple food, interspersed with her own accounts and tips among the recipes. With her mastery of the ingredients and with the experience of having shared Korean temple cuisine all over the world, Wookwan is able to connect with the preparer, gently guiding at each step. Korean temple food has been practicing what we now call the “farm-to-table” concept, using ingredients that are only homegrown or naturally cultivated, combined with an eco-friendly, clean eating mindfulness with a history of over 1700 years. It is also mindful vegetarian cuisine; it does not use any animal products save for some dairy ingredients, nor does it use the “five spicy vegetables,” green onions, garlic, chives, leeks, and onions that are thought to distract the mind; instead, flavors are precisely crafted by thorough understanding of the ingredients and their natural aromas. 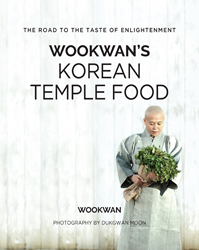 Temple cuisine holds at its very core a reverence for life, and Wookwan’s 41 meticulous recipes embody her philosophy and conscientiousness for nourishing the not only the body, but the soul. Techniques such as fermentation and creating natural extracts and broths are included in this cookbook, as well as ways to substitute ingredients that are more readily found to recreate the very flavors of the Dorak Mountains right at home. Michael Pardus, Professor and Chef instructor of The Culinary Institue of America Hyde Park says, "By combining Buddhist respect for nature and all living things - fresh ingredients and people - with the flavors of traditional Korean cuisine, and applying a trained Chef's skill and artistry, Wookwan gives us a delicious introduction to preparing clean food with sincere practices; healthful for body, mind, and spirit." To celebrate her first English cookbook, she will have special lecture and hands on class at Urbani Truffle Lab N.Y.C. in July 17th. For detail information, please visit wookwan.eventbrite.com.